Amy Peltz and Dove Rutter (BFA Performance 2020) at New Blood XII. Photograph by Jackie Rivas. When choreographer and dancer Trisha Brown died last year, it felt like losing a loved one. Until the last years of her life, she made new work that challenged the very landscape of contemporary dance and interrogated the stand-still the practice has been in since Judson Church. While watching Cherrie Yu’s (MFA Performance 2019) “Trisha and Homer,” one of the works in “New Blood XII,” the School of the Art Institute of Chicago’s (SAIC) annual student performance art festival, I was moved to reflect on Brown’s life and legacy, and the impact of her passing. In Yu’s ten minute video, the filmmaker recreates Brown’s seminal “Accumulation with Talking plus Watermotor” followed by a second recreation of a custodial worker mopping a busy building in downtown Chicago. When Brown’s death was the first thing Yu mentioned following the screening, I believed she also felt her wisdom while making this work. What I couldn’t believe was that dancers in 2018 are still using the “pedestrian” movements of the working class as a study for movement-making. So much of Trisha Brown’s work hinged on elegant, intelligible, effortless simplicity; it would have behooved performers at New Blood to have taken a page out of her book. In its 12th year, the annual festival program, curated by Kyra Lehman (MFA Performance 2019), Maria Luisa Conlon (BFA Curatorial Studies), and Aram Atamian (MFA Performance 2019) intersperses video works with performances and other media between two proscenium spaces and the lobby area at Links Hall, a performance space in Roscoe Village. Not surprisingly, the most effective works were the most pared down, the most able to sublimate those experiences of the world that are most difficult to articulate into temporality and movement. The least potent were, of course, the longest and most self-important. To this end, the festival really hit the ground running. Armin Hayrapetian (MFA Film, Video, New Media, and Animation 2020), Sami Ismat (MFA Performance 2020), & Divyamaan Sahoo’s (MFA Sound 2020) “Glory, honor and all those epics or By the shore rested a body” kicked off the event in the Black Box Studio with a ninety minute durational work consisting of three performers wearing white shirts and khakis who manipulated long strips of clay in two stage lit boxes kitty corner from each other on the floor. One lay down next to the clay, punching or otherwise coming into contact with the clay and moving it onto a plank. The other performer wet the plank with water from a bucket, wrapped it in linen, and slowly relocated it to the stage at the rear of the theater while a third performer called out fragmented poetry in the stands amidst an original score. The “bravery” of using the stage was probably the most gripping component of the ultimately unimaginative and tedious piece of performance, which was effective only in offering me a series of questions that I held onto for the remainder of the evening: what is it about men that make them think you want to watch them complete a task for an hour and a half? Where does the urge to arbitrarily engage with text come from, and how can we resist this urge? Why establish rules just to completely disavow them moments later, thus betraying one of the principal tenets of performance? How could something so derivative of Cassils’ “Becoming An Image” be so boring? 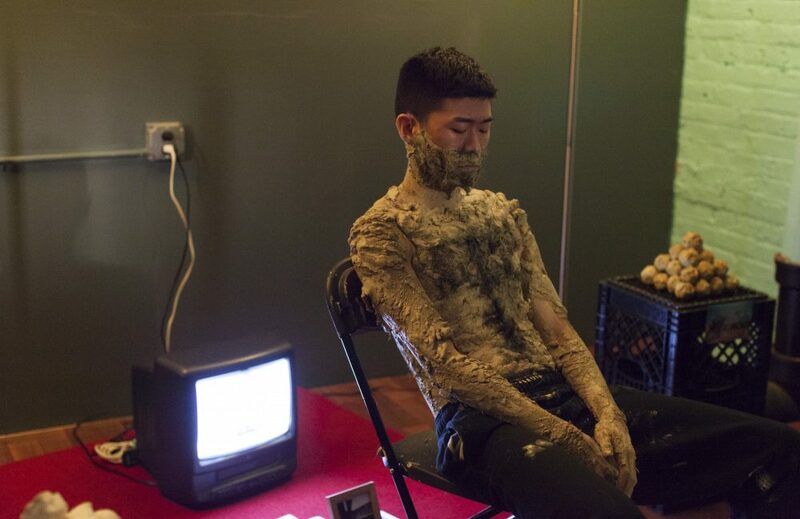 Sung Jae Lee (MFA Performance 2019) performs “My Own Private Iowa” at New Blood XII. Photograph by Jackie Rivas. B’Rael Ali Thunder’s (MFA Painting and Drawing 2020) “Peace Brings War” proved a further vexatious lesson in how sometimes more is way, way less. The piece opens with Thunder pretending to paint a crude rendition of a woman on a canvas, which was accompanied by large video projections of his own paintings. Inexplicably, a dancer covered in pastel paint climbed through a large vaginal split in the canvas and performed solo accompanied by Thunder’s spoken text (seriously, why can’t we resist this urge)? What followed were several non-cohesive acts that transitioned abruptly, with multiple dancers coming in and out from the wings. Forgetting for a moment the literal objectification of a woman’s moving body, any singular concept that could have been derived from the otherwise competent and evocative dancing was completely bogged down by an abrasive theatrical mélange of speech, music, and video. 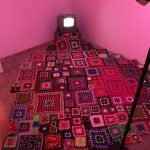 It recalled the most dated CGI moments of “The Matrix” or some psychedelic screensaver from the era of Windows ‘95 (although not in the tradition of the long-trending pastel digital aesthetic employed by “New Blood XII” participant Anneli Goeller (MFA Film, Video, New Media, and Animation 2019) in their online exhibition). Based on audience participation alone, which was enthusiastic, I earnestly wanted to enjoy the piece — but with the cash-only bar restrictions preventing me from a second cocktail, I couldn’t put aside my own pretensions for long enough. Raghav Rao’s (MFA Writing 2019) performative PowerPoint “What If They Don’t Like Or Need Me,” about the ardent desire to avenge his first memory of overt racism inflicted by a Kindergarten classmate after seeing her sister on the train in present day New York City, was dryly hilarious because of Rao’s unassuming voice. But it suffered the same near-ruination by not pushing far enough. The impact was dampened by the ending resolve, in which Rao demonstrates empathy for the young racist’s dysfunctional family. Beside the fact that the non-dysfunctional family is simply a fallacy, the inscrutable experience of wanting to inflict pain on someone who has harmed you in the past is far more nuanced and connective than the ending compromise. Behind the bar in the lobby, Julian Flavin (MFA Film, Video, New Media, and Animation 2019) sat unobtrusively playing electronic drums along to a live recording of The Weekend at Lollapalooza that viewers could access via noise cancelling headphones. As one sits at the bar listening to Flavin’s intervention in the song, the more sinister undertones of the piece addressing Chicago’s lucrative festival culture as an abetment in the city’s segregation reveals itself, making it one of the more contemplative and surprisingly effective performances of the evening. Sung Jae Lee’s (MFA Performance 2019) “My Own Private Iowa,” which made use of the Black Box theater’s dressing room, was probably most effective in giving me an opportunity to “check back in“ with “Glory, honor … ” in its second half. The contrast of the much-missing campiness of Lee’s vignette amidst the heavy handedness of the durational performance just outside its walls was striking. In the dressing room, participants confessed their sins to a sprawled out Lee, who was surrounded by familial altarpieces and candles covered in thick, caked-on yellow clay. Lee pulled a piece from his naked torso, balled it up, and offered it as a gift to the viewer. The ball was totally disturbing and disgusting — as warned by a proctor at the entrance. Jake Himovitz and Lily Linz (BFA 2024) perform “Moody Athletics.” Photograph by Jackie Rivas. The festival had its fair shake of more traditional contemporary dance. Sahoo made another appearance in a solo dance work entitled “Flatland.” An apparent nod to “Line Describing a Cone,“ Sahoo is a deliberate and engrossing mover to be sure. There wasn’t much, however, to write home about save a confusing and awkward hourglass prop motif. The most grievous curatorial error of the evening was programming the two contemporary dance duets back to back. Though watching Jake Himovitz and Lily Linz (BFA 2024) perform “Moody Athletics” felt like being trapped at a high school talent show, it lasted a merciful ten minutes. The dancers took turns enacting unconvincing endurance tasks as if to channel Bill T. Jones without any of the grace or poise. The performance was made somehow more hokey by the inexplicable inclusion of inhalers, indicating an unexplored asthma motif. The glaring lack of intimacy and any chemistry whatsoever between them was crudely underscored by the eloquence and intimate imaging of the piece that followed. 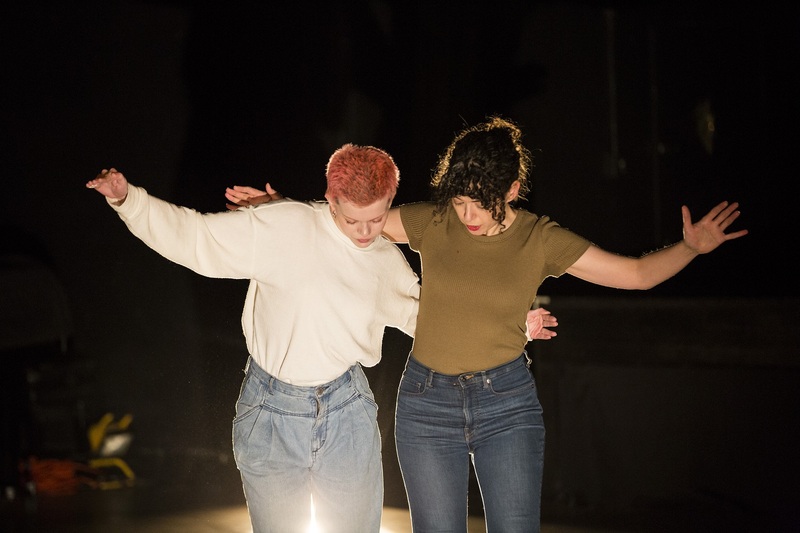 Amy Peltz and Dove Rutter’s (BFA Performance 2020) ethereal “Perseverance” gave new physicality to vernacular movements, the act of breathing, and the space itself. Exploring and activating the space together for the entirety of the piece, the process was both exposed and covert, like looking through a keyhole to a complicated and inexpressible relationship. Easily the most compelling works of the evening were both saved for last and hidden in the early hours of the festival. Ashara Renfroe’s (BFA Sound/ Performance 2020) wall of sound “Beyond,” which compounded audio imagery at the intersection of black identity and Christianity, such as haunting choir music, crude newsreel footage, and a vast unplaced ocean, was entrancing in its sophistication and austerity. Sitting alone dutifully manipulating a sampler in the center of four uniform powered speakers, Renfroe layered a twenty minute soundscape that was perfectly timed, crafted, and intense. Panic did briefly set in when Kai left the round to sit next to an audience member. Bar none my least favorite performative tool, a cheap way to “engage” the audience and communicate discomfort, I was shocked that I didn’t find it cheesy or obnoxious. It just worked. Ultimately, therein lies the difference between a good performer, and a successful performance maker; the phenomenology of what works, and what just doesn’t.